A Jedi was a member of the Jedi Order, who studied, served and used the mystical energies of the Force; usually, the light side of the Force. The weapon of the Jedi was the lightsaber, a weapon with a blade made of pure energy. The Jedi fought for peace and justice in the Galactic Republic, usually against their mortal enemies, the Sith and Dark Jedi, who studied the dark side of the Force. 1. 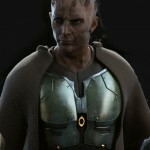 TOR Jedi Armor plating consisting of accurate chest, forearm/wrist, hand, cod, thigh and shin armor. Armor should be painted in a camo green/earthy color scheme, with silver accents similar to source images. LFL blue ‘release’ color scheme is allowable. Armor should be well fitted to the wearer without excessive gap between chest and cod plate. 2. Light Brown full body undersuit, specifically tights or other body fitting clothing. One or two piece, but join must not be easily visible. Any zippers must be hidden by robe. 3. Dark brown ankle high slip on Boots, with no zippers/laces, able to be tucked under shin Armor. 4. Brown Jedi Robe, heel length, with sleeves finishing at the elbows/wrist gauntlets, and deep hood. 5. Dark brown full fingered gloves, with grip on the palms. 6. Non toy lightsaber hilt. If bladed, blade may not be red or black. 4. Full body undersuit constructed of thermal or ribbed material as seen in images with light brown bias tape around visible neckline. Costume standard by Matthew Wilson. Approved by Costume Standards Committee / LMO 2/21/12.